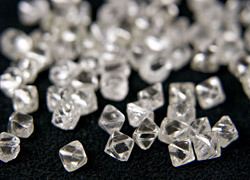 We are provided with rough diamonds directly from the mine corporations. 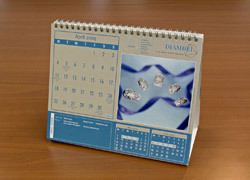 Picture seen on the left is the year 2005 calendar from DIAMDEL, which is the group company of the DeBeers. It is the first time for a Japanese company, to have, its picture and credit inserted in the calendar. Exceptionally in the Asian area, we are privileged to buy 2.5ct. to 10ct. rough diamonds. From these supply, we produce high quality O.E. cut diamonds. In order to process diamond, mastered craftsman inspect every single rough diamonds thoroughly and by going through every step, rough diamonds produce its true beauty. The O.E. 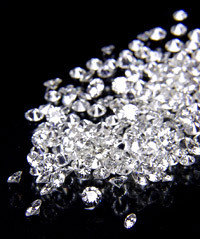 cut diamond is produced under strict control in both domestic factories and foreign factories. We work hard to improve in quality by using many types of inspection devices. Committed to innovate the cutting technique to present the O.E. diamond to the world. Please refer this page for O.E. cut diamond.